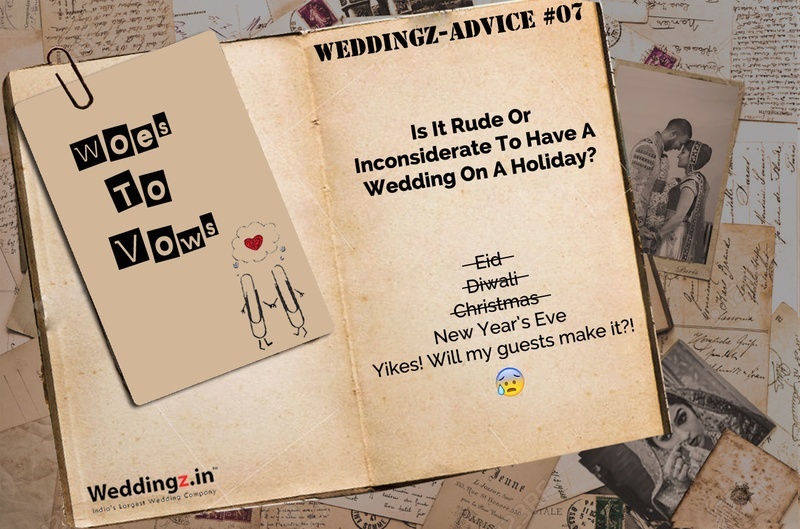 Having a wedding on a holiday can be fun, but will it be considered rude, inconsiderate or inconvenient for your guests? We Indians love to celebrate festivals, be it Holi, Diwali, Christmas or New Year’s, the diversity that flourishes in our country leaves us no room to be brimming with smiles, cheer and merriment with the numerous occasions we have fitted in one calendar. Long weekend holidays, summer holidays, as well as Diwali and Christmas holidays are popular to host weddings because these weekends and festival times come with built-in work offs and if you have outstation guests they too can well plan and attend your celebration. Festive holidays also keep guests in light and cheerful mood to be a part of any celebration. However there are tons of hidden obstacles when it comes to holiday weddings. Scroll on as we give you simple solutions to get hitched with a glitch if you’re planning a wedding on a holiday. If it’s a national holiday or a long weekend coming up, chances are your guests have those dates free and will be more than delighted to attend all your pre-wedding and wedding celebration on a holiday. Festive seasons and no sale, that’s just impossible. Most retail outlets, as well as online stores offer amazing discounts during the festive seasons. This will help you save a lot more monies for your wedding, as well as honeymoon. With a long holiday on hand, there is no chance for any of your family members to miss out on any of your functions. Festivals are a great time for family bonding and what better than hosting your wedding at this time too. Most people wait for festive and long weekends to find a reason to escape from the city. If family and friends have already booked their tickets to visit Hong Kong Disneyland or reservation to places they simply cannot undo, you have no choice but to strike them off your guest list. Holidays and the whole world seem to be moving somewhere to go jam packing the streets. This could lead to most guests either tuning up late or not showing up at all at your wedding. No one likes to work on a holiday and even if services are available these 2 to 3 times high in cost. These include your vendors as well as venue, so be ready to shell out some more moolah out of your pocket. Well, this is a no-brainer indeed. Most suppliers don’t work on holidays. So if you’re thinking of last-minute shopping or last-minute arrangements, think again! SO, NOW HERE’S WHAT YOU NEED TO DO TO STAY AHEAD OF THE GAME! Remember the traffic jams we mentioned earlier. So to avoid getting stuck up, ensure your wedding venue is not just convenient for your guest, but you as well to reach. If you want all your guests to make it to your big day, ensure you send your save-the-dates or wedding invites much in advance, so that your guests lock in the dates. Take advantage of the festive season sales that spring up in all local to big retail stores. Be prepared with the list of items you want well in advance to avoid disappointment later if you’re unable to get your hand on the promotional items. This is the best time for you to stock festive wedding favours to give to your guests, as well as any other items for your honeymoon or new home to pack up right away. To help you guests not miss out on the festive mood, juts because they are attending your wedding. Give them a taste of the festival by incorporating it in your decoration, food menu or have activities, like burning sparkles at your entry or exit if it’s a Diwali wedding or cookie exchange at your pre-wedding function if it’s a Christmas wedding. If this eases your worries, you’re not the only one is pondering on getting married during holidays. There are many couple out there taking advantage of the holiday season. So if you don’t want to end up not having those lilies decorated around your mandap or your favourite dessert running out of stock, communicate and over-communicate with all you suppliers and vendors confirming availability, details and pricing. Don’t forget to do regular follow-ups without pestering them of course. Dry cleaning is one of the things that can easily slip one’s mind and spring up at the last-minute. To avoid looking untidy on your special day get all your bridal outfits and grooms wear dry cleaned ahead of time. If you’re planning to fly away for your honeymoon soon after your wedding then it’s advisable to book your tickets and get your visas and required vaccinations sorted in advance just to avoid last-minute hurries and extra costs. Days preceding your wedding is going to be chaotic. With you running and busy most of time in some activity, ritual or the other, its nest to pack for your honeymoon early, just to ensure that you haven’t left sun block or that oomph-y outfits you specially bought to wear at your honeymoon.